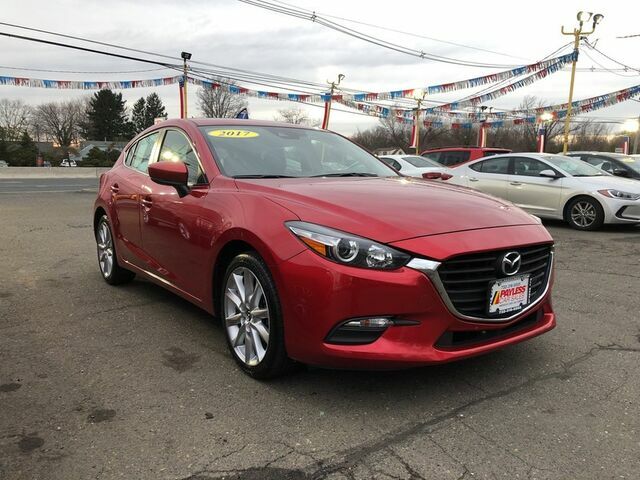 This Payless Certified Pre-Owned 2017 Mazda Mazda3 5-Door has been thoroughly inspected and reconditioned before you buy it. When you pull it off the lot youll enjoy even greater peace of mind knowing that it has at least 12mths/12,000 miles of powertrain warranty, has been fully serviced and qualifies for rates as low as 3.99% and many other benefits. Contact Payless Car Sales for a full list of benefits. $499 DOWN Guaranteed Approval!!! Save money at the pump with this fuel-sipping Mazda Mazda3 5-Door. Clean interior? How about flawless. This Mazda Mazda3 5-Door looks like has never been used. This Mazda Mazda3 5-Door is well-equipped, well-cared for and still covered under the manufacture's factory warranty. Marked by excellent quality and features with unmistakable refined leather interior that added value and class to the Mazda Mazda3 5-Door More information about the 2017 Mazda Mazda3 5-Door: Mazda's goal with the Mazda3 has always been to offer the most fun-to-drive compact car on the market. The Mazda3 directly competes with some of the best-selling cars on the road, including the Honda Civic, the Toyota Corolla and the Hyundai Elantra. With a starting base price below $18,000, the Mazda3 is competitively priced while still maintaining enough upscale features to feel like a much more expensive car. With a sportier and more direct driving feel than its competitors, the Mazda3 is able to do everything typically asked of a compact, while still putting a smile on the face of drivers. This model sets itself apart with Efficient, powerful drivetrains, good use of space, loaded with features, and unique styling Call now (732) 316-5555 This one won't last! Whether you have good credit, bad credit, no credit or even in a bankruptcy or repossession we can help. Our goal is 100% guaranteed approval!! Call us at 732-316-5555 or come on in to our South Amboy, New Jersey showroom and one of our credit specialists will help you get the vehicle you deserve at a payment you can afford. The advertised price does not include sales tax, title, DMV fees, finance charges, prep fee and documentation charge of $389. All financing subject to lender approval, rates and terms may vary. Any payments listed are an example and not an offer or guarantee or terms and are subject to lender assessment of credit,down payment and term. Prices subject to change at any time. While every reasonable effort is made to ensure the accuracy of this information, we are not responsible for any errors or omissions contained on these pages. Please verify any information in question with your sales representative.